Journeys across Karnataka: What to see in Raichur District? When you look at the four north-eastern districts of Karnataka, it looks like a neat stack.. Raichur, Yadgir, Kalburgi and Bidar. Raichur's southern and northern borders run along two great rivers Tungabhadra and Krishna. So Raichur was known as Doab meaning 'land between two rivers'. The district is mostly black soil plains with scattered hills. Raichur is known for its thermal power station, paddy fields & rice mills, gold mine and a special variety of granite. Raichur's history can be easily traced back to Neolithic times. Mudgal and its surrounding area are known prehistoric sites. Archaeologists have found several prehistoric artifacts on Maski hill. Then there's Emperor Ashoka's inscription at Maski - the edict of peace - which is an indication that this land was pert of the great Mauryan empire. Then it was ruled by Satavahanas Vakatakas, Kadambas, Chalukys, Kalachuris, Kakatiyas, Vijayanagara, Bahamani and finally the Nizam of Hyderabad. Coming to the name Raichur is the anglecized version of Rayachooru. There are many stories about how the name came into being. One of them goes like this.. A chieftain on witnessing a spectacle of a rabbit turning on a dog that pursued it and tearing the dog into pieces. The chieftain thought the spot was special and fit for a fort and constructed one naming it as Naichur which connoted the idea of the dog being torn to pieces. The present name, Raichur, is said to be have derived from that Naichur. Another story is that the name originated from combining the word Rai meaning stone in Telugu with Ooru meaning town. The product was Rajooru which becomes Rayachooru over time. Well, there are other stories about the name's origin but do check out this write-up on origin of the name Raichur. During Bahamani rule, Rayachooru had been reamed as Ferozenagar which was never accepted and reverted to its original name. When Karnataka state was formed, Raichur district came into being with Raichur city as its headquarters. Raichur fort - The modern city has grown around the ancient citadel which had two rings of fortification. The outer fortifications has five gateways- Naurangi Darwaza on the north, Kati Darwaza on the east, Khandak Darwaza on the south, Doddi Darwaza on the south-east and Mecca Darwaza on the west. The inner fort has two gateways- Sailani Darwaza on the west and Sikandari Darwaza on the east. The core of the fort is the fortified hill. Mavina Kere - The largest water-body of Raichur is also known by the name Aam Talab is situated south-west of the hill fort. It was constructed during the rule of Kakatiya queen Rudramma Devi of Warangal in 1294 CE. Navarang Darwaza - one of the five gates of Raichur fort is a protected monument. Within the premises is a collection of ancient stone sculptures. Usukina Hanumappa Gudi - Usuku means sand in Kannada. This shrine dedicated to Hanuman was once surrounded by sand. However now its stone slabs instead of sand. Manik Prabhu Gudi - This is an old temple situated on a hillock on the city outskirts. Manik Prabhu is a saint of XIX Century. People believe that he was the fourth incarnation of Lord Dattatreya who was born in 1817 and attained Samadhi in 1865. He was contemporary of Shirdi Baba and Akkalkot Swami Maharaj. Agriculture University - The vast campus of the university is situated on the western side of the city. Those driving in from Dharwad side have to pass by the campus. Jami Masjid, Raichur - This is the largest mosque in Raichur city. Ek-Minar-ki-Masjid - An mosque with one minar built in the Persian style during Bahamani rule. The minar is 13' in diameter and 65' high. It has a winding staircase leading to its top. In April 2016 during a road widening operation an adjoining building was demolished, the damaged walls revealed pillars and beams with images of Hindu Gods and motifs. Samples of the ancient rubble were sent for examination and confirmed to be rubble from destroyed Hindu temples of Hoysala period. Maliabad fort - This fort situated 6 kilometers south of Rayachooru dates back to Kakatiyan times. It was known as Mallayyabanda which later transformed to Maliabad when Muslim rulers took over. The fort is built on a rocky hillock and the adjoining plain land. The fort has two rings of fortification, the outer ring is relatively older while the inner ring is built of finely dressed massive granite blocks. On the hillock is said to be a Kannada inscription dating back to Hoysala or Vijayanagara times. Within the fort is a Goshala which produces medicine out of Gomutra (cow's urine) which is used for treating many diseases. 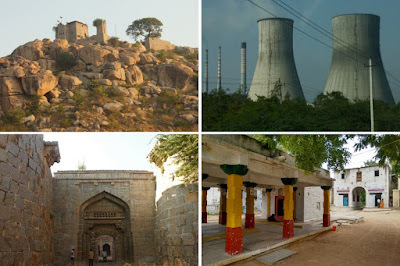 Raichur Thermal Power Station - As you drive from Raichur to river Krishna, you will see the massive cooling towers and chimneys of RTPS. River Krishna supplies water to this is a coal powered electricity generation plant. The plant is operated by the Karnataka Power Corporation Limited. The power station consisting of 8 power generating units was commissioned between 1985 and 2010. About 40% of power generated in Karantaka is contributed by RTPS. Tourists might be allowed into the plant but high level permissions would be required. The township for RTPS employees is called Shaktinagar. Sri Sugureshwara Temple, Devsugur - is an ancient shrine dedicated to Lord Veerabhadra. Locally the god is called by the name Sugureshwara, This spot is about 20 kilometers north of Raichur and right besides RTPS township. Naradagadde - is an island in river Krishna situated about 38 kilometers northeast of Raichur city. Legend says that Lord Narada performed penance on this island. The nearest land villages are Boodidipadu (Budidipad) which is in Karnataka state and Nettempadu which is on Telangana side. On the eastern tip of the island is a shrine dedicated to Lord Shiva. On the western side of Naradagadde is another island called Kurugadde. Kurugadde - is an island in river Krishna situated about 35 kilometers northeast of Raichur city. This island is about 5.7 kilometers long and half kilometer at its widest point. On the island is a village called Kuruvapura and agricultural plots. On the western tip of the island is a temple dedicated to Sripada Srivallabha. The nearest land village is Atkur. Manvi fort - is on the smallest of three hillocks situated south of Manvi town. The fort is in complete ruins. Within the fort is a Dargah. 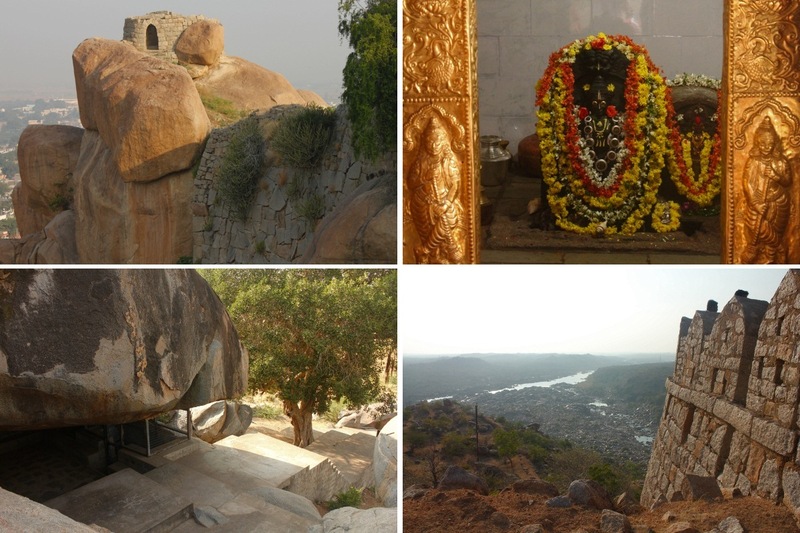 On the largest of the hillocks, is an ancient shrine dedicated to Sri Mallikarjuna. Also Manvi is known for numerous fairs held at temples deducted to Hindu gods like Kareyamma, Yellamma, Mahamalleshappa and Sanjeevaraya. Mahalaxmi Devastana and Markandeshwara Gudi - these two temples are at Kallur village. The village is situated to a boulder heap hillock which is an identified prehistoric site. The town was fortified long time back but hardly anything remains of the fort today. The village is popular for Sri Mahalaxmi Devastana. Though not popular Sri Markandeshwara Gudi is an ancient temple probably built during Chalukyan times. Panchamukhi Anjaneya Devasthana - is an ancient cave shrine dedicated to Lord Hanuman situated near Gandhal village, about 40 kms south of Raichur. Gandhal village is situated close to left bank of river Tungabhadra and on the opposite bank is popular Hindu pilgrim center Mantralaya - the resting place of Madhwa saint Sri Raghavendra. Road distance between Gandhal and Mantralaya is about 20 kilometers. Legend says that Sri performed a 12 year penance at the cave, as a result Lord Hanuman appeared in the form with five heads. Hence the name Pancha-Mukhi Anjaneya. There are two routes to reach Gandhal- 1. Raichur to Gandhal and 2. Manvi - Neermanvi - Gorbal - Gandhal (about 12 kms on Manvi to Raichur road, turn right towards Gorbal). Ashoka's edict of Maski - Of the nine edicts discovered in Karnataka one is located on the slopes of Maski hill. The edict is a protected monument but tourists are allowed to see the site. Maski hill is an identified prehistoric site. In August 2012, few human skeletons were discovered along with ancient pottery. The ancient graveyard was found close to the stone inscription of Ashoka. Also, close to the edict, just behind Devanam Priya College is a mound with stone etchings of animals is believed to be of Chola period. Mudgal fort - Built on a rock hill and the neighboring plain land, Mudgal fort was a formidable fort during its hey days. Mudgal was an outpost of Kakatiya kingdom in XIV Century. In the XVI Century it was part of Vijayanagara empire before Bahamanis took over. The fort has two entrances-one in north and the other on the eastern side. The southern part of the fort is defended naturally by hillocks and steep rock faces while a moat runs along the northern perimeter. Bastions and turrets are strategically placed on the rampart walls. On the rocky hillock is a tower known as Bala Hisar, probably used as a command post. Near the Bala Hisar is a rock shelter in which prehistoric paintings are found - this is evidence that Mudgal's history goes back to Neolithic times. Also, in the shelter is a rare rock which sounds like a metallic bell. In fact within the fort are two bell rocks. Coming back to the fort, there are at least 5 to 6 slabs with Kannada inscription probably of Vijayanagara times. Its a historic spot one must see. Sacred Heart of Jesus Church, Mudgal - The Sacred Heart of Jesus Church is said to be established during the reign of Ibrahim Adil Shah. The original structure was built around 1557; later it was demolished and the present day building was built in 1971. Piklihala - is a village 5 kilometers south of Mudgal. Piklihala is an identified Neolithic site. Jaladurga fort - is one of the few island forts of Karnataka. The fort stands on the western tip of a 8 km long island created by river Krishna. The fort is surrounded by chasms and its natural defense is water hence the name Jaladurga. Close by, downstream is another island with a small fort on it. Mukkunda fort - is in Mukkunda village situated on left bank of river Tungabhadra in Sindhanur taluk. It is about 30 kms from Sindhanur. In this village are three historical monuments - a small fort atop a rock formation and ancient temples dedicated to Murari, Somalingeshwara and Bheeralingeshwara. The fort could be built during 16th Century CE. Also, there is Dargah of Gaddikhader Wali situated on the island in Tungabhadra. Roudkunda fort - is in Roudkunda village in Sindhanur taluk. To the west of the village are two hillocks which are identified as Neolithic sites. Artifacts were found on the hills and the valley between them. On one of the hillocks is a small fort built during 16th century CE. 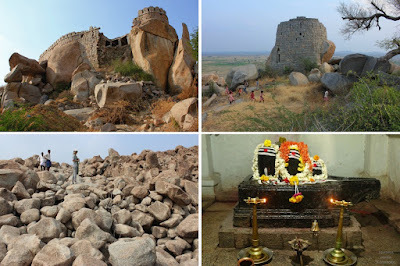 Devadurga fort - is situated in the village of the same name. The fort main fort is on a hillock besides the village and within the village is a smaller fort like structure housing a palace within. Devadurga village is known for availability of talc. Kotekal fort - is an ancient fort situated on a hillock close to Kotekal village. The fort ruins are visible from the state highway connecting Raichur and Lingsugur. Tryambakeshwara temple of Kavital - Kavital is a small village situated off Raichur - Lingsugur highway. The ancient temple probably of Chalukyan times is known for its deity - three Lingas on one pedestal - it is said this is the only one such shrine in India. Watagal hill - is a huge naturally formed boulder heap. In the aerial view it looks a tadpole. The name Watagal could be derived by the Kannada phrase Wattida Kallu which means heap of stones. Ont this hill are ruins of a fort. Also the hill is identified as a prehistoric archaeological site. This hill is situated off Raichur - Lingsugur highway. Mudval - is a village 8 kilometers north of Maski. It is an identified Neolithic site where gold crushers and iron slag was found. Gurugunta - is a town in Lingsugur taluk known for Gurugunta Samsthana of Naiks who were related to rulers of Kankagiri and Shorapur. Kadlur - is considered as a sacred place. The village is situated close to Krishna-Bhima Sangama. According to an inscription found at Chikalparvi, Krishnadevaraya of Vijayanagara had visited this pilgrim center. History would have been more interesting if we had it this way. Amazing Sid !! such a nice thought, Bharath. you can be the one to spark the change..
೧೨ನೇ ಶತಮಾನದ ಕಲ್ಯಾಣದ ಹತ್ಯಾಕಾಂಡದ ನಂತರ ಸಾವಿರಾರು ಶಿವಶರಣರು ಪ್ರಮುಖವಾಗಿ ಮೂರು ಗುಂಪುಗಳಾಗಿ ಪಸರಿಸಿದರು. ಒಂದು ಗುಂಪು ಅಲ್ಲಮಪ್ರಭು, ಅಕ್ಕಮಹಾದೇವಿ ನೇತೃತ್ವದಲ್ಲಿ ಶ್ರೀಶೈಲದ ಕಡೆಗೆ, ಬಸವಣ್ಣನ ನೇತೃತ್ವದಲ್ಲಿ ಕೂಡಲಸಂಗಮದಕಡೆಗೆ, ಚನ್ನಬಸವಣ್ಣನ ನೇತೃತ್ವದಲ್ಲಿ ಉಳವಿಯಕಡೆಗೆ ಪ್ರಯಾಣ ಬೆಳೆಸಿದರು. ಬಸವಣ್ಣ ಕೂಡಲಸಂಗಮದ ಕಡೆಗೆ ನಡೆಯುವಾಗ ಜಲದುರ್ಗ ದಲ್ಲಿ ತಂಗಿದ್ದರು ಎಂಬ ದಾಖಲೆಗಳಿವೆ. ಹದಿಮೂರು ಹದಿನಾಲ್ಕನೇ ಶತಮಾನದಲ್ಲಿ ಕೊಡೇಕಲ್ ಎಂಬ ಪ್ರದೇಶದಲ್ಲಿ (ಜಲದುರ್ಗಕ್ಕೆ ಹತ್ತಿರದಲ್ಲಿ ) ಕೊಡೇಕಲ್ ಬಸವಣ್ಣ (ಈತ ೧೨ನೇ ಶತಮಾನದ ಬಸವಣ್ಣನಲ್ಲ. ಆತನನ್ನ ಕಲ್ಯಾಣ ಬಸವ ಎಂದು ಕರೆಯಲಾಗಿದೆ.) ಎಂಬಾತ ಬೇಡರ ಪಡೆಯನ್ನು ಕಟ್ಟಿ ಆದಿಲ್ ಶಾಹಿಗಳ ಕಾಲದಲ್ಲಿ ಅವರೊಂದಿಗೆ ಕಾಳಗಕ್ಕಿಳಿದು ಶರಣ ಧರ್ಮವನ್ನು ಉಳಿಸಿದ. ಆತ ಮತ್ತು ಆತನ ಸಂಗಡಿಗರು ಇದ್ದ ಪ್ರದೇಶ ಜಲದುರ್ಗ. ಅಲ್ಲಿ ಕೋಟೆಯೂ ಇದೆ. Thanks for sharing this information, Ganesh Sir. Wow, this wonderful. Raichur for us is one of least explored district in Karnataka. This post will definitely come handy when we plan a visit to Raichur. Raichur is my native, but wonder is Sid knows more than me. He is very good in collecting information. Sid I should expect more travels and info from you. Sir, Allama Brabhugalu haagu Akka Mahadevi yavaru Kalyan krathi gintha mudene avaru Shrishylakke talupidru anno maatide. Thanks for your note on Allama Prabhu and Akka Mahadevi.